North to South down the Eastern side of Europe. Having travelled across Europe from West to East in April 2009, I made another long-distance train journey across the continent in September the same year. The trip was timed so that I would be in Sarajevo for my 50th birthday. I was joined on the trip by Bill Bird, who suggested that we start the journey in Moscow and pay a visit to our friend Sasha, who had also just reached his half century. I travelled to Brussels (where Bill lives) by Eurostar, and we both flew from there to Moscow Domodedovo airport with Brussels Airlines. Sasha and his daughter Anya met us at the airport and took us into the centre of Moscow. 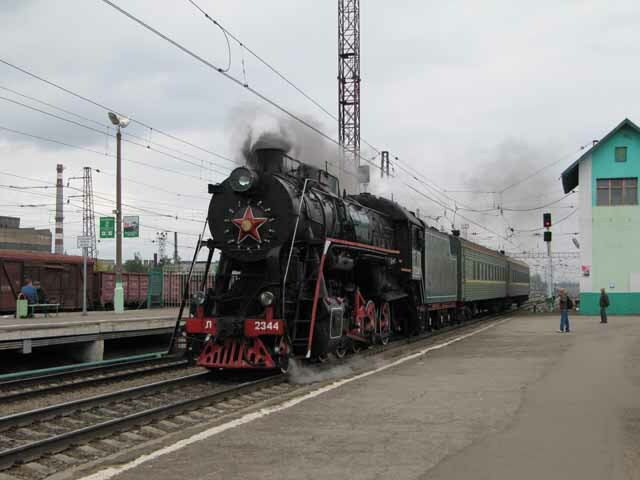 Sasha had arranged a surprise trip for us on a steam train to the historical city of Kolomna. This train only runs once a month, so we were lucky with the timing of our visit to Moscow. The three of us left Kazanskiy station in Moscow at 9.20 behind an 'L' class steam loco, and the journey to Golutvin station took two hours. From there, a bus took us the short distance to the historical centre of Kolomna. 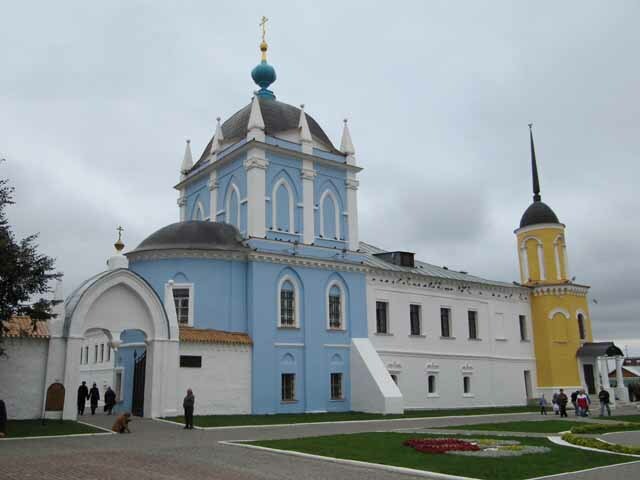 Kolomna has its own kremlin (citadel), not as famous as the one in Moscow, but nevertheless interesting and well-preserved. We spent a couple of hours wandering round the kremlin, monastery, old town and city walls, before finding a restaurant for a late lunch and a few beers. We caught the tour bus back to the station for the steam train back to Moscow. 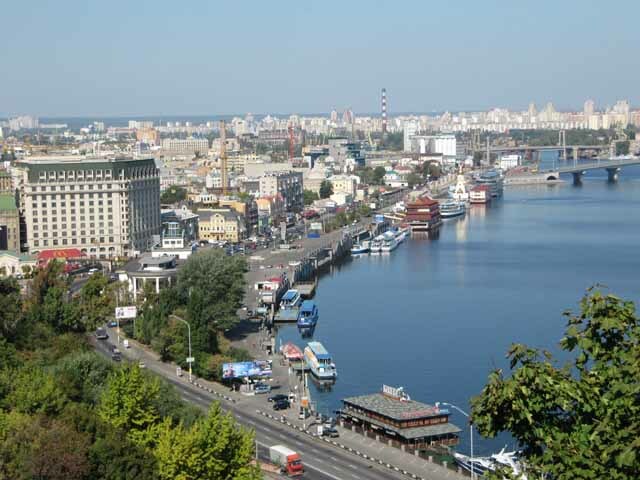 We had booked the onward train journeys to Kiev and Budapest in advance through Real Russia (who also supplied our Russian visas). For the Moscow to Kiev train we had been sent an "e-ticket" which we needed to exchange for a "real" ticket before travel. This could be done at any station in Russia, but we chose to do it at our departure station, Kievskiy, a couple of hours before leaving. We then had time for an evening meal (shashlik) and a couple of beers at a resaurant across the road from the station, before saying goodbye to Sasha and boarding the train. 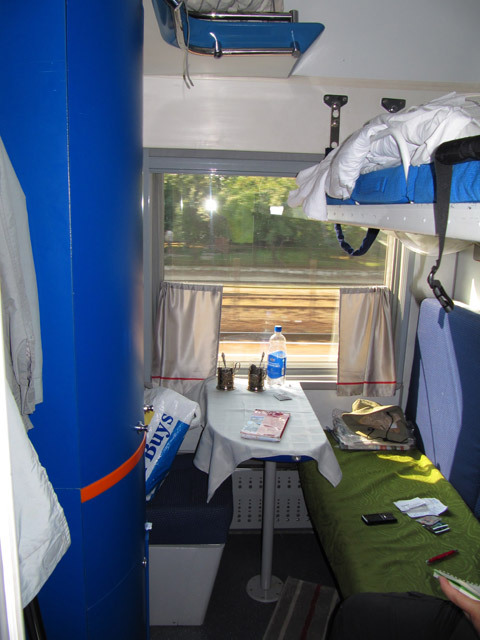 The train was formed of Ukrainian Railways sleeping cars, which were clean and comfortable. Bill and I were in a 4-berth compartment, with one other passenger. 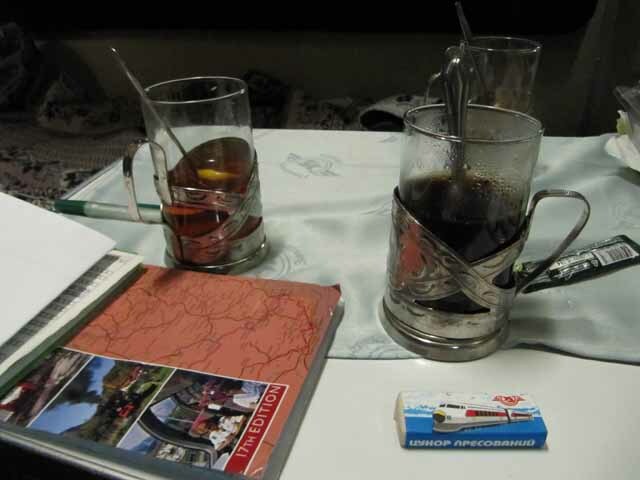 We were provided with tea and coffee by the provodnik (sleeping car attendant), in the traditional Russian style glass with metal holder. We never spoke to the other occupant of our compartment, and as he went to bed at about 10, we settled down shortly after. But there was piped music playing until 11.30, and we couldn't turn it off. I was aware of a long station stop, and probably a locomotive change, shortly after midnight, which was probably at Sukhinichi. 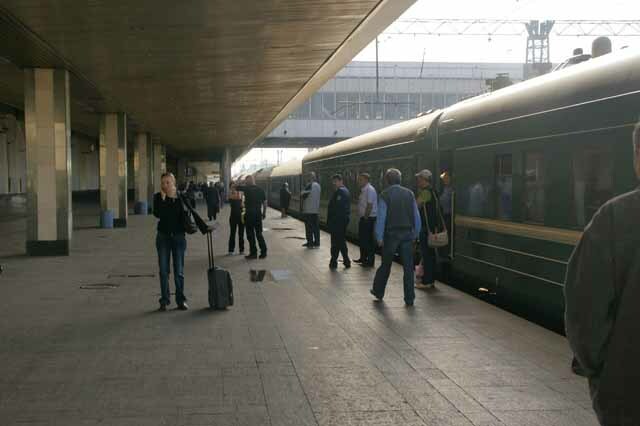 A couple of hours later, at Bryansk, we were woken by the Russian border guards for a passport check. There was a chance for some sleep then until the first station stop in Ukraine, Konotop, which we reached at about 5 o'clock. A new country for me, and another stamp in the passport. We arrived in Kyiv (as the Ukraininans prefer to spell it) on time at 7.50. We spent about an hour just observing trains arriving and departing at the station, and taking photos. We changed our unspent Russian roubles into Ukrainian hryvni, then bought some tokens for the metro. The tokens cost UAH1.70 each, which at an exchange rate of GBP1 = UAH14, gives a flat fare of just 12 pence. We took the metro to the main square, Maydan Nezlezhnosti. We had a Lonely Planet guidebook, which suggested a walking tour of the city, so we followed that. It was much warmer than in Moscow, with clear blue skies. 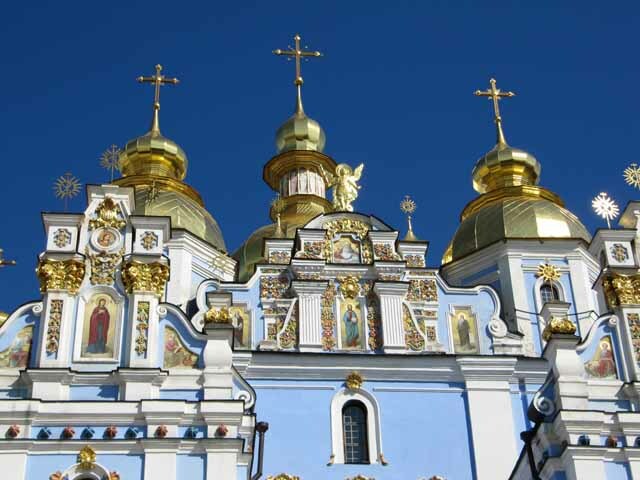 We took in most of the main sites in the town centre, such as the Parliament Building, the Soviet-era Monument to Russian-Ukrainian Unity, several monasteries and cathedrals, the famous Golden Gate (rebuilt 1982! ), and the Bessarabskiy market. 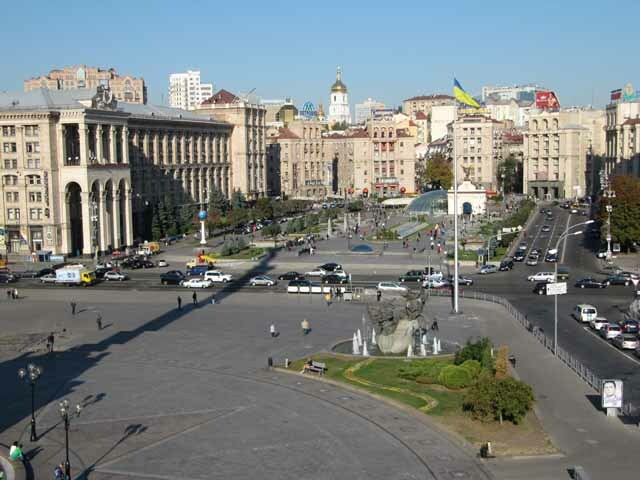 By mid-afternoon cultural fatigue had set it, so we called in at the Arena bar, for a couple of their house beers, before returning along the main drag, Khreshchatyk, to our hotel, the Ukraina (a "Soviet-style monstrosity", according to LP). In the evening we walked down to the Podil district, by the Dnipro River, and found a restaurant for dinner (pork with onions and french fries). We then took the metro back into the town centre and had a beer at home-brew bar Шато (Chateau) before bed. We had plenty of time for a buffet breakfast at the hotel, as our train did not leave until 11.10. We used the metro to get to the main railway station, which is some distance from the town centre. The Kiev metro is similar to its Moscow counterpart, with long escalators descending deep to spacious platforms, but it is not so elaborately decorated. 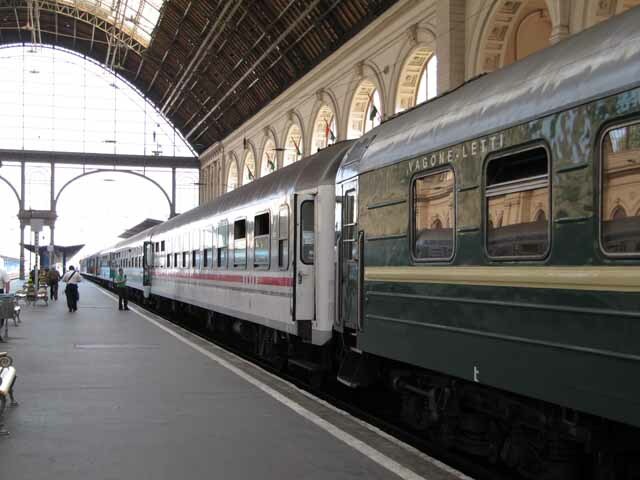 Our train had travelled overnight from Moscow, and was mostly formed of Russian Railways coaches going to Uzhhorod (Ukraine), but also had through sleeping cars for Zagreb, Belgrade and Žilina (Slovakia). Our reservation was in the Zagreb coach, but on boarding we were re-allocated to another coach which was only going as far as Budapest. We settled in to our compartment for the 24-hour journey, then started thinking about lunch. We didn't have a lot of Ukrainian currency left, and wanted to leave ourselves with enough for an evening meal as well, so just had a Greek salad each. The prices were quoted only in Russian roubles, but we found they also accepted Euros so we could have splashed out a bit more, but the salad was sufficient. During the afternoon the train was delayed several times by single-line working for engineering works. Like all Russian long-distance trains, a timetable was posted in the corridor, so we could check progress (or lack of it) - at one point we were 100 minutes late, but on a journey of this nature that doesn't really matter. We were able to buy tea and biscuits from the provodnik. We decided to have dinner relatively early, at about 6 o'clock, as we suspected the crew might be running on Moscow time so might stop serving early. I had salmon for 12 Euros, which was expensive for what it was, and they probably wouldn't get much trade from ordinary Russian or Ukrainian passengers. There was no Russian or Ukrainian beer on sale, but the Czech Kozel went down well. There was a long station stop booked at Lviv, and although we were still running late, we could see that the locomotive was being changed, so it was safe to get out and stretch our legs on the platform. Enterprising locals were selling food and drinks to passengers on the platform, so we each bought ice cream for dessert and some bottles of beer for a nightcap. 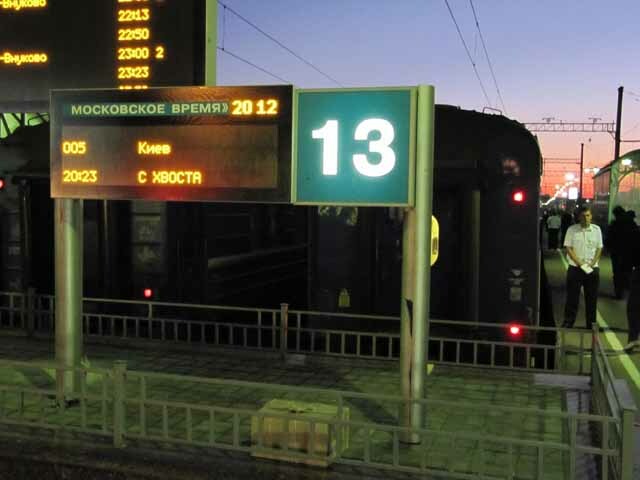 During the night, the Ukrainian departure passport and customs check took place at Chop, and then the train was jacked up and the bogies changed for standard-gauge ones. There was a short run over the border to Zahony, where the train stopped for another hour for the Hungarian border control. So I didn't get much sleep. During the morning the train continued westwards through the flat plains of Hungary. There wasn't a restaurant car on now so instead of breakfast we just got a cup of tea and finished off the biscuits left over from yesterday. The train arrived in Budapest on time, just before mid-day. Our priorities in the 2 hours we had in Budapest were money, tickets and lunch. 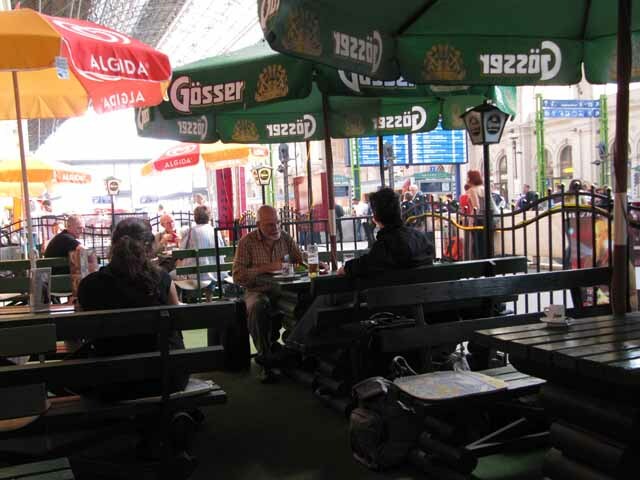 We got some Forints from an ATM, bought first class tickets to Zagreb, then had lunch in a cafe on the station. We had plenty of time for a short stroll outside the station, but it's not an attractive part of the city, and there was a large construction site for the building of Metro Line 4. Keleti (East) Station itself is quite impressive, with statues of British engineers Stephenson and Watt on the facade. 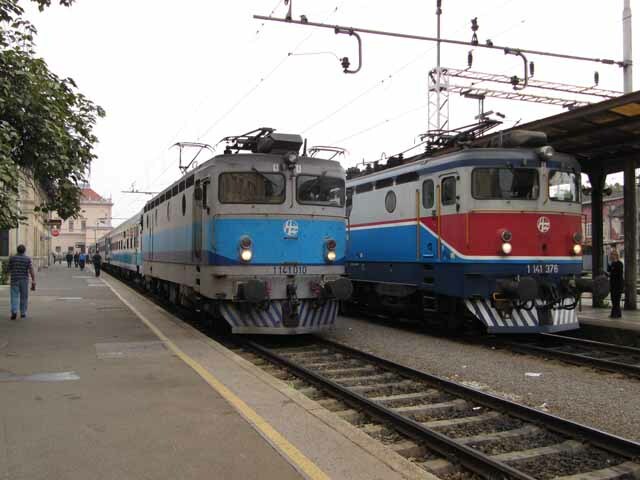 The Zagreb train left at 14.00, and was composed of Hungarian and Croatian seating cars plus the Russian sleeping car which had been on the train from Moscow and Kiev. I wonder how many people make the 48-hour journey all the way from Moscow to Zagreb? It was a pleasant run southwards in the afternoon sunshine, alongside Lake Balaton. There was some delay at the last Hungarian station Gyekenyes before we crossed the border into Croatia, and we were about 20 minutes late arriving into Zagreb. We checked in at the Best Western Astoria hotel (pre-booked before we left home), and then made our way to the Tomislav bar and restaurant, a perennial favourite with railway enthusiasts because of its good value meals and home-brewed beer. I went for the 40 kuna 3-course set meal of soup, pork steak, pancake. I was very tired and ready for bed. There was a good buffet breakfast at the hotel, but not enough time to enjoy it as we had get to the station to buy tickets (allowing plenty of time for hassle) and then catch the 8.55 train to Sarajevo. Getting tickets was no problem, and we had time to buy some sandwiches for lunch (no guarantee of any food being available on the train, even though it's a 9 hour journey). We initially had a compartment to ourselves, but were soon joined by a smelly old man. He must have been aware of this, as he got out a can of air freshener and sprayed himself with it. We managed a bit of conversation with him (I can't remember what language we used), and he was returning home to Novi Grad in Bosnia after visiting his family in Croatia. 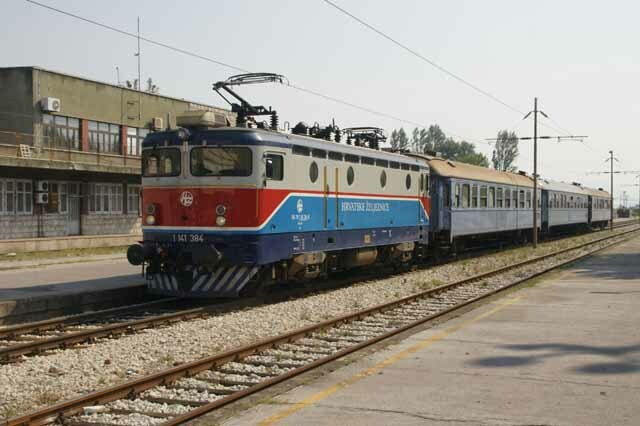 At the Bosnian border, our Croatian electric loco came off to be replaced by a similar one belonging to Republika Srpska Railways. The train continued through pleasant scenery, interrupted by the large industrial town of Banja Luka, with its largely derelict railway workshops. We had another loco change at Doboj before crossing the "inter-entity" border between Republika Srpska and the Federation of Bosnia & Herzegovina. Things have certainly got complicated in this region since the break-up of Yugoslavia. We arrived in Sarajevo about an hour late, at seven o'clock. Our next challenges were to get some Bosnian money and get to the hotel. For our first night we were booked in the Hotel Safir in the old part of town. There didn't seem to be anywhere at the station to get money, so we walked to the nearby Holiday Inn, expecting to be able to exchange some euros at the reception desk. But they said they didn't have any Bosnian money! Just as we turned to leave, we spotted an ATM in the hotel, so used that to get some 'Convertible Marks', which have the same value as the defunct Deutschemark. At the tram stop near the hotel, there was no sign of a ticket kiosk, and we didn't know whether the driver sold tickets (and if he did, he probably wouldn't appreciate a large denomonation note for a small fare), so we just jumped on board the next tram. Just our luck that two inspectors got on at the next stop, and we had to stump up the equivalent of about £12 each as a penalty fare, while feeling like naughty schoolboys. Still, the Sarajevo tram system probably needed the money more than we did. When we got off the tram, finding the hotel was not easy. Bill had printed off a street map of the area from the Mappy website, but it bore little resemblance to the complex warren of narrow streets and alleyways in the area. We eventually found it, checked in and dropped off our bags before heading straight out again for a meal. We had decided to eat at Sarajevsko Pivovar (Sarajevo Brewery), which I had used a year earlier. A good meal, washed down by the local beer, restored our spirits and we discussed options for the next day (my birthday). 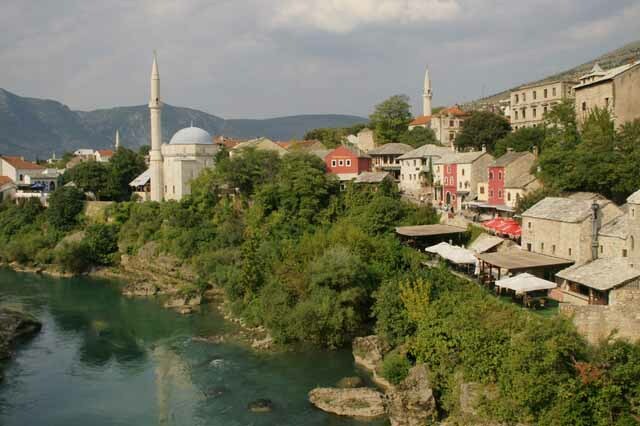 We could spend the day in Sarajevo, take the train to Mostar, or take the train to the end of the line at Ploče, on the Adriatic. 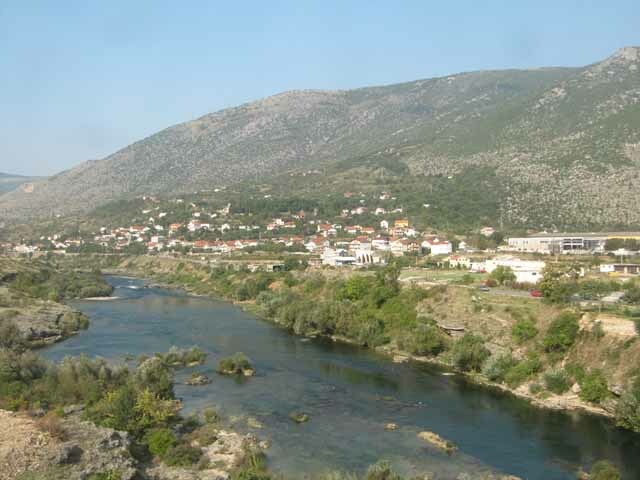 We decided on the latter, and while the train service alone would not allow us to travel to Ploče as well as visit Mostar, we thought we might be able to get a bus back from Ploče to Mostar. No lie in on my 50th birthday, we had to be up for the morning train to Ploče. There were a few small shops already open at 6.30 and we were able to buy croissants and bananas for breakfast before catching a tram to the station. This time we were able to buy tram tickets from a kiosk (you can buy from the driver but it's slightly more expensive, or perhaps 'less cheap' might be a better description). There was a queue at the station ticket counter, and we were surprised to see that tickets were being written out by hand, but this was being done quite quickly and the queue was moving fast. We had time to buy a coffee on the station before boarding the train, which left at 7.05. The train had just three coaches, old Swedish ones now past their best. It was very crowded, as there was a school party travelling to Mostar, and we had to stand for the first two hours until they had left. The route between Sarajevo and Mostar is very scenic, and we enjoyed it despite having to stand. The overcrowding did not prevent a refreshment service operating along the train. Near the end of the journey, we crossed the border into Croatia, and even though only the last few kilometres are in Croatia, we changed locomotives and crew. The border check was quite cursory, and we did not get any stamps in our passports. We arrived in Ploče on time at 11.05, and had a quick look around the large station. It was once an important terminus on the Yugoslav network, but now just sees 2 "international" trains a day (to/from Bosnia) and a few locals to the border. We walked to the port area and then towards the main part of town, before noticing signs for buses pointing back towards the station. We found the bus station next to the railway station, and saw that there were plenty of buses to Mostar. We got some Croatian money, and tried to book for the 13.15 bus, but when we got the tickets found that they were for the 12.05, so we didn't have time for lunch in Ploče. The bus was full, and I had to stand as far as the border. The passport check was again very brief, and the bus stopped for 20 minutes at a café on the Bosnian side. The rest of the journey to Mostar was uneventful, arriving at 2 o'clock. 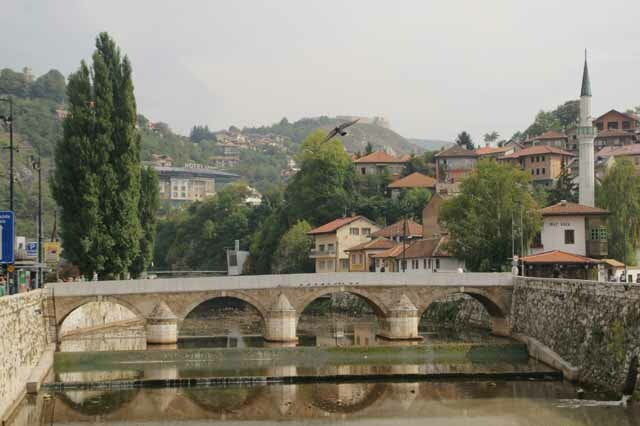 We made our way down to the famous Old Bridge, rebuilt since being destroyed in the Bosnian war. The whole area around the bridge is very attractive, with its narrow cobbled medieval streets, and is becoming popular with tourists again. We did a quick reccie of the area and then had a late lunch in an outdoor café close to the bridge. Although the area around the bridge has been thoroughly restored, if you wander away from that area there is still much war damage visible, such as bullet-marked walls and even a few ruined buildings that have not yet been cleared up. We caught the evening train back to Sarajevo, and we managed to secure a seat despite it being busy with the same school group as on the morning train. Refreshments were again available, and I was able to buy a bottle of beer to celebrate my birthday. Tonight we were booked in the Holiday Inn, which is near the station, so we checked in there before walking into the old part of the town. It was quite late and we found that most restaurants appeared to be closing, so we had to settle for čevapi (sausages) in a fast food place, then found a cake shop that was still open for coffee and dessert. There was no rush to do anything this morning, so we had a leisurely breakfast at the Holiday Inn at 9.30. The buffet breakfast was quite good, but the coffee that was freely available was pretty awful, and it cost 6 marks to get a decent cup of cappuccino. We took a tram towards the old town (buying a ticket from the driver, now that we had some loose change), but it got about two stops before coming to a stand with the road ahead appearing to be closed off. After a few minutes, people started to get off the tram, so we did the same and walked the rest of way into town. 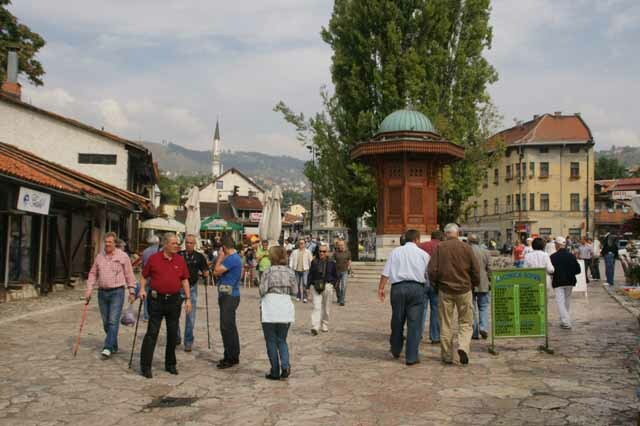 It became clear that many roads were closed for the Sarajevo Half Marathon, which provided some interest as we made our way towards Baščaršija (Turkish Quarter), which is the focal point of the Old Town. It was sunny but very hazy, which meant that that mountains which surround Sarajevo and add to its visual appeal, were not so prominent. Nevertheless, the attractive buildings and friendly atmosphere make it one of my favourite cities. At midday we headed across the Miljacka River to the Sarajevsko Brewery, for a couple of beers and an excellent final meal of the holiday. We took a tram back to the hotel to pick up our bags, and then a taxi to the airport. I flew back with Adria via Ljubljana to Gatwick.